There was a time, not so long ago, when we would be crying out for our favourite childhood comic book heroes to blast their way onto the big screen. And now that it’s happened, not so much. With both Marvel and DC now saturating the market, audiences now find themselves drowning in superhero titles. Luckily for them, we can now all be saved by the fishy Aquaman! Having made his brief cameo in 2016’s Batman V Superman: Dawn of Justice, he signed up for a more substantial role in the following year’s Justice League, but he finally gets to tell his origins tail (sic) here. 1985, Amnesty Bay, Maine, and lighthouse keeper Tom (Temuera Morrison) is busy lighthouse keeping, until a beautiful woman, Atlanna (Nicole Kidman) washes up on the shore during a storm. She’s badly injured, but he does his best to look after her. During this process, the pair fall in love. This wouldn’t normally be an issue, but Atlanna isn’t from this land, in fact, she isn’t from any land at all; she lives in the underwater city of Atlantis, where she reigns as queen. Unfortunately for her, she has been betrothed to another, in an arranged marriage. She manages to not only stay with Tom for some time, they even have a child together, who they name Arthur. But only after a few years, she realises that she’s putting her family in great danger by staying with them, and makes the difficult decision to return to Atlantis. As Arthur is no ordinary boy, she entrusts his training to her trusted advisor Vulko (Willem Defoe), who teaches him the ways and powers of being part Atlantean, which include super strength, telepathic powers with marine life and being a nifty swimmer. Some years later and Arthur (Jason Momoa) is now a fully grown man-fish, living a relatively normal life. 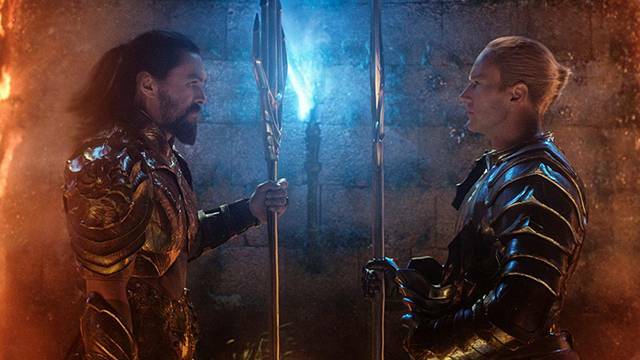 This changes however, when he is visited by Mera (Amber Heard), who hails from Atlantis to inform him that the surface dwellers are in serious danger. So you see, my trident is just that little bit bigger than yours. In a crowded superhero market, bustling with latex outfits and flowing capes, you have to bring something new to the table to stand out. The USP for Aquaman is his ability to exist both above and below water. Obviously this would be less of a challenge for an animated feature, but for a live action, it’s an entirely different kettle of fish. And unfortunately, it’s a challenge that Aquaman struggles with throughout. The good news is, whoever was in charge of the underwater hair effects did a swell job. Everything else however is pants. You have numerous characters darting through the water at breath-taking speed, and as ludicrous as it sounds – for a film that for the best part takes place underwater – it looks unnatural. It would help if they were Mer-people with big fins attached to propel them, but they don’t. Maybe it’s just the fact that we’re used to characters flying through the air; there’s nothing unnatural about watching Superman fly, and yet there’s nothing to believe that he can, other than telling an audience he has ‘super’ powers. Perhaps the illusion is more difficult to swallow as characters manage to speak underwater. Even the great flowing locks can’t detract that is all looks a bit weird with mouths opening and closing with words coming out at the bottom of the sea. But say you do buy into all the sea walking and talking malarkey, you still have to buy into the script, which is actually a far taller order. It is outrageously convoluted and far too serious for its own good. It’s understandable that there is a certain formula to telling an origins story, but that doesn’t mean you have to do so at the detriment to creativity. As the film develops, it becomes clear that it struggles with forming its own identity. 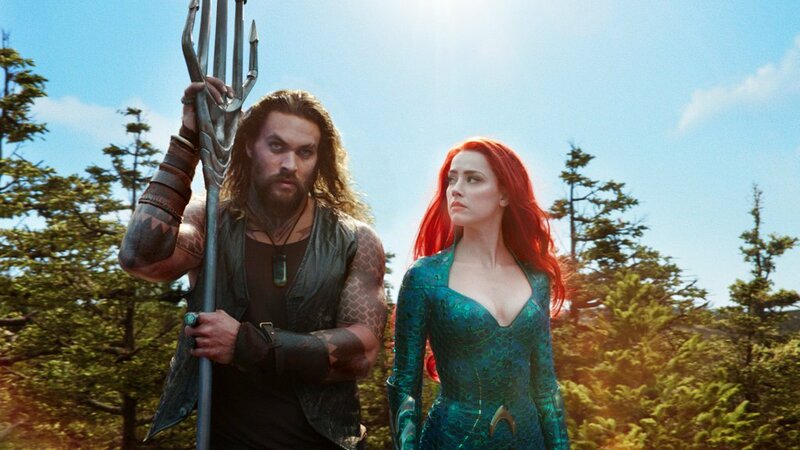 It borrows from so many other films before it, particularly the relationship between Aquaman and Mera, which has borrowed heavily from Harrison Ford as both Han (with Leia) and Indy (with Marion) for some much needed witty repartee. And although a big budget affair – to the tune of $200 million big – there’s a definite B-movie air about it. In fact, it has more in common with the classic 1980’s Flash Gordon than it does with its current superhero peers; all that’s missing is the voice of Brian Blessed booming – underwater, natch – Arthur’s Alive!!!! To his credit, Momoa just about holds it together with a solid performance as Aquaman; it takes a certain kind of guy to walk out of the sea onto a beach with nothing but jeans on and get away with it. He’s also the only outlet there is for humour, and although you wouldn’t necessarily expect that from looking at him, he puts audiences in their place with some neat one-liners. We still vehemently maintain that if Taika Waititi isn’t directing your superhero flick, then why bother. This bloated mess has done nothing to change our minds. The fact it made such a splash at the box office sadly guarantees not only a sequel, but even a possible spin-off of its own currently going by the title The Trench. Let’s hope that neither are as wet nor shallow as this large drip.